Game Over, Pete Watson by Joe Schreiber. Review: In this thrilling, extraordinary story, a normal geek, gamer named Pete Watson has to face the consequences of something he did not think would harm him in any way. In Game Over, Pete Watson, by Joe Schreiber, Pete has to face an abundant amount of difficulties throughout his marvelous adventure. The confused Pete looks for clues with his best friend Wesley Midwood and his sister, Callie Midwood. As they fight all these clever, mischievous plotting villains, he has to worry about other problems. Pete has so many problems to think about, he has to take them one at a time. Pete Watson is just an ordinary kid who plays video games a lot. He isn't usually recognized for anything. People don't think about him because he is usually playing the video game BRAWL-A-THON 3000 XL! That's his favorite game on his top ten lists. All of this begins when he sells his dad's gaming system, the Command-Roid. What he doesn't know is what he has done. He doesn't know what info is inside, or if whatever inside it is important until, he meets the bug man and the super villain Miss Wertley. Once he sells that Command-Roid for $20, something terrible happens. People in suits in a black car kidnap his dad. They drive off without anyone knowing or seeing it. Pete tries to tell everyone, but the only one who will listen is his friend Westley and his sister Callie. Will Pete find his father? What is in the Command-Roid? Why is it important? Read the book to find out! This book is honestly the best I have ever read. I personally liked this because it is a fictional story. I am not much of a fan of non-fiction stories. I also liked this because I like video games. I like how Jon Schreiber elaborated on the plot and made into such a phenomenal story. A sequel would be amazing. A sequel to Game Over, Pete Watson could be much more. It would be great to see new villains, a new friend, and new video games. The action, the plot, and the character personalities are what made me like this story so much. I absolutely died laughing at the story pictures. It helped me visualize what was going on. The parts that I liked best were when Jon Schreiber put in statements like "In the future version of this book, there would be a video showing this, but for now you just have a picture." Those parts are hysterical. Game Over, Pete Watson is great for particularly boys that are in middle and elementary school, but anyone into video games and digital monsters will love it. In my head, I've always been waiting for this type of book. Jon Schreiber did an extraordinary job on writing this story. We would like to thank Houghton Mifflin for providing a copy of Game Over, Pete Watson for this review. 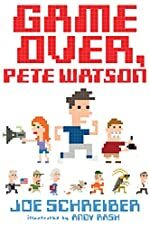 Have you read Game Over, Pete Watson? How would you rate it?